Experience all that San Francisco can offer with this comprehensive Mega Pass. Arguably the most progressive and beautiful city in the United States of America, San Francisco is an amalgamation of sights, scenery and food. You will get additional tickets for top attractions in San Francisco. This valuable San Francisco MEGA PASS includes 3, 4, or 5 options from over 25 popular Tours and Activities in and around town. The pass is valid for 7 consecutive days! Tickets must be exchanged before boarding the bus at 2724 Taylor St Suite B, San Francisco, CA 94133, USA. With this incredible San Francisco MEGA PASS which includes 3, 4, or 5 options from over 25 popular Tours and Activities in and around town. You can experience some of San Francisco’s TOP attractions by choosing your favourite activities! 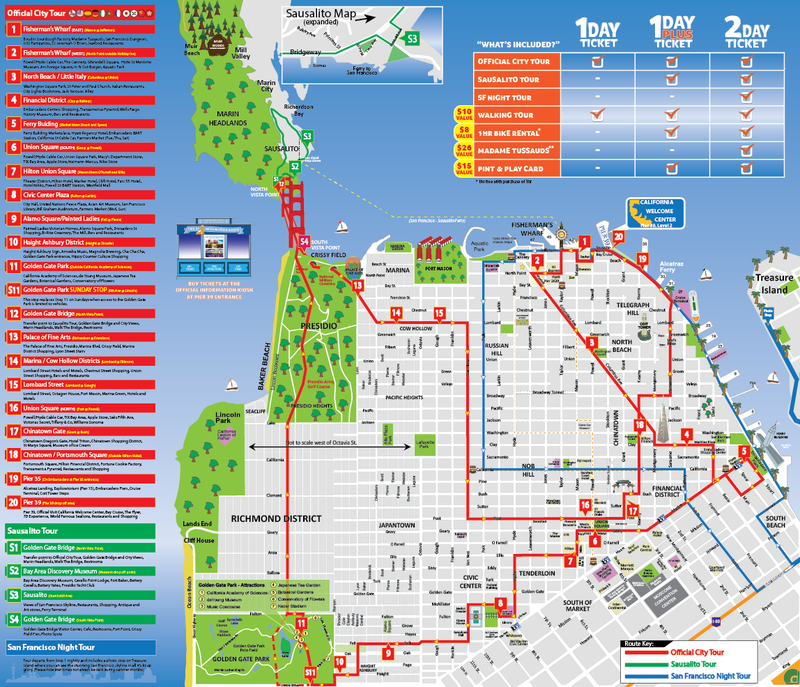 Depending on the selected pass option, you will be able to add 3,4 or 5 San Francisco favourite attractions to your itinerary. Play with the Sevengill Sharks at the Aquarium of the Bay and see the city’s skyline from the water during a fascinating Bay Cruise or during a thrilling ride on the Rocket Boat. Take a bike to explore Golden Gate Park or ride a storytelling GoCar along the Marina. Discover the life of Mickey Mouse’s creator at the Walt Disney Family Museum, meet Barack Obama and E.T. at Madame Tussauds or learn about modern art at the SFMOMA. Take a ferry to Angel Island and Sausalito with great views of Alcatraz Island and the Golden Gate Bridge. You may choose from many other tours and attractions, making your San Francisco visit the most exciting and fun filled experience ever! Please specify which attractions you wish to undertake while redeeming your tour voucher. Voucher information: Sorry, but we will need you to print a paper version of your booking voucher (we're working on changing this ). At this time no refund can be given for customers without a printed copy of their voucher. On Thanksgiving Day, Christmas Eve, and New Year's Eve last Hop-On Hop-Off Tours will depart at 4:00pm (instead of 5:00pm) will not be running. You may choose the attractions upon redeeming the voucher in San Francisco, no need to pre-select when booking. The best way to tour San Francisco!